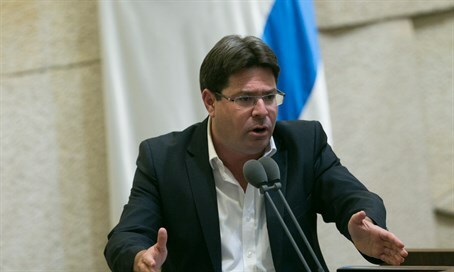 Science and Technology Minister Ofir Akunis (Likud) on Wednesday visited the protest tent set up in front of the Prime Minister's Residence in Jerusalem last Friday, which is calling for decisive action against the recent wave of lethal terror attacks. "I came here to strengthen the residents of Samaria and the government in its struggle against Palestinian terror," said Akunis. "I said it many times in the past and I'll say it again now: construction in our country is a right - not a favor. The international attempt to connect this right with any diplomatic struggle is invalid." Turning to a call for action, he said, "I believe we need to adopt the Edmund Levy Report and renew the construction, without any connection to the escalation of terror. In terms of a Palestinian state: my position, which negates the idea of its establishment, has not changed." The 2012 Levy Report proved Israel's presence in the Biblical heartland of Judea and Samaria is completely legal according to international law. Despite being commissioned by Prime Minister Binyamin Netanyahu, the coalition government has yet to adopt the report. While no member of the coalition government has yet raised the Levy Report in a call to implement it, one party vowed to demand its adoption if elected - that party was the Yachad - Ha'am Itanu joint list with Otzma Yehudit that just missed out of the elections by a few thousand votes. Akunis's statements come after the US State Department denied reports from Tuesday, which revealed Prime Minister Binyamin Netanyahu folded to American pressure following threats that if Israel approved new construction, the US would not veto a looming UN Security Council resolution establishing "Palestine" and declaring "settlements" in Judea-Samaria illegal.